People in India are in their joyous mood as they are captivated in the celebration of the New Year's Day, as per the Hindu calendar. Where Maharashtrians is celebrating Gudi Padwa, Ugadi, also spelt as Yugadi, is the New Year's Day for the people of Andhra Pradesh, Karnataka and Telangana. The Telugu or Kannada New Year's Day is observed in these regions on the first day of the Hindu lunisolar calendar month of Chaitra. 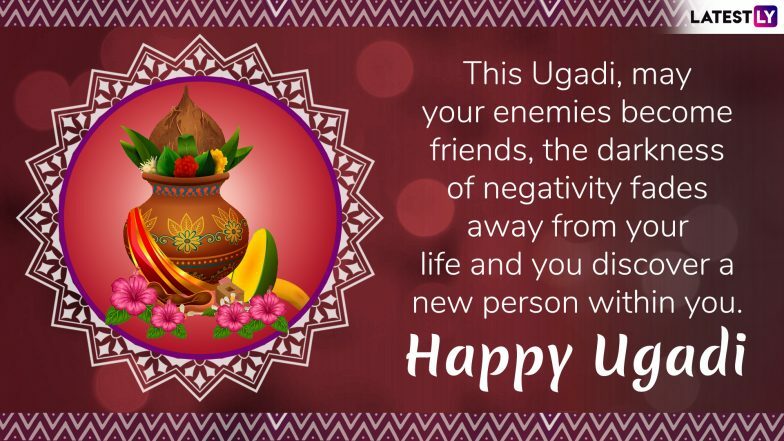 It is on the auspicious occasion, when everyone looks for Ugadi 2019 messages and greetings in English to wish their near ones. In this article, we bring you a fantastic collection of Ugadi images and wishes along with super cool GIFs that you can share with your friends and family through Facebook, WhatsApp Instagram and other social media platforms. Share the warm and heartfelt 2019 Ugadi greetings along with WhatsApp stickers on the Telugu New Year's Day. Simple Ugadi Kolam Rangoli Patterns to Celebrate Marathi New Year. Every year, Ugadi typically falls in March or April of the Gregorian calendar. People in Andhra Pradesh and Telangana use the term Ugadi, while Karnataka uses Yugadi for the festival. The preparations for Ugadi begin a week in advance and include customs which is related to many spring festivals like house cleaning and buying new clothes. This year, Kannada New Year falls on April 6, and people will be seen adorned in new costumes, visiting Hindu temples and attend family gatherings to celebrate Ugadi. 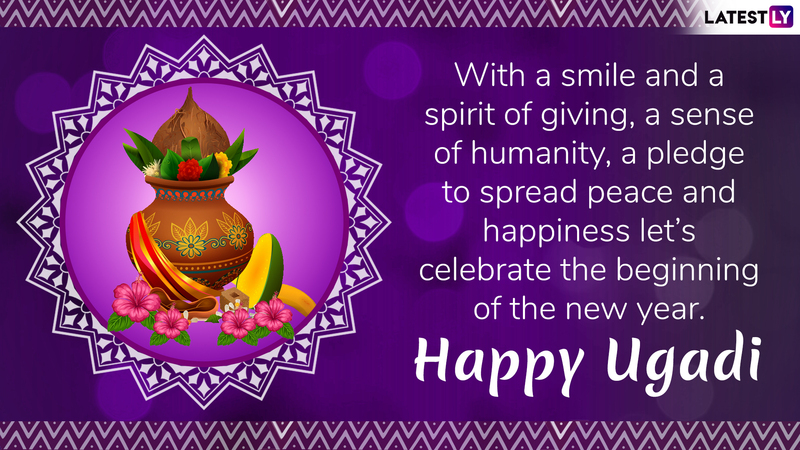 As you welcome the Telugu New Year, share the meaningful 2019 Ugadi messages and greetings with your family members and make it yet another beautiful moment to cherish for life. Share These Chaitra Navratri 2019 Wishes During Nine-Day Festival. WhatsApp Message Reads: Ugadi means new year, new hope, new achievements and new aspirations. Wish you a blessed and happy Ugadi. WhatsApp Message Reads: Welcome the New Year with complete anticipation, hope and eagerness. Look forward to a bountiful year of prosperity, satisfaction and peace. 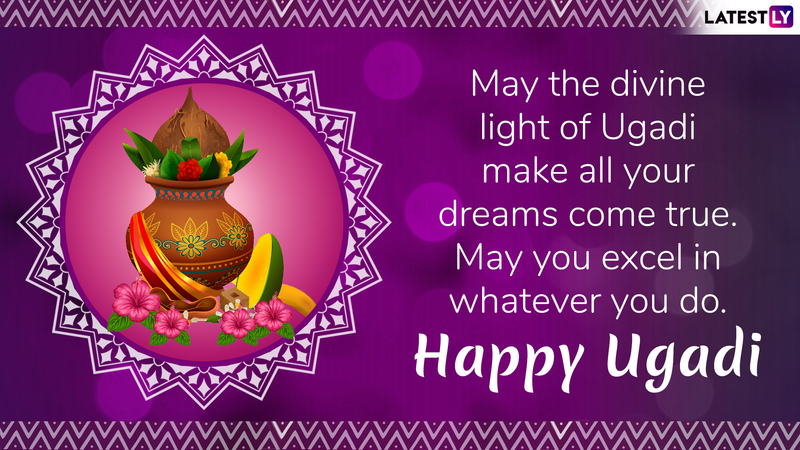 Happy Ugadi! With the advent of technology, Indian festivals have become more fun. WhatsApp has unveiled amazing stickers for all the festivities and the collections are superb. Just like other celebrations, you can find Ugadi animated stickers to share with your friends and family members, extending your warm greetings in the Telugu New Year's Day 2019. Download Ugadi WhatsApp stickers from the playstore and welcome the New Year with as much enthusiasm. The Telugu, Kannada, Kodava and the Tulu community residing majorly in Karnataka, Telangana, Andhra Pradesh, Tamil Nadu and Kerala celebrate the festival with great fanfare. Gatherings of the extended family and a sumptuous feast are significant during the Ugadi festivity. We hope that the above collection of Ugadi images, messages and wishes will add more festive charm to welcome the New Year.